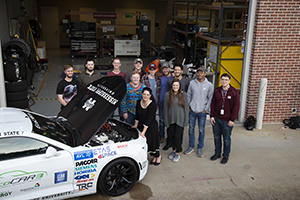 Professor Strzelec, pictured in middle, with the Mississippi State University EcoCAR team, which she co-advises. One of the main objectives of #HugYourEngine is to shine a spotlight on individuals who are helping make internal combustion engines cleaner and more efficient. The first spotlight is on fellow Wisconsin graduate, Andrea Strzelec. Andrea is an Assistant Professor in the Department of Mechanical Engineering and principal investigator of the Combustion & Reaction Characterization Laboratory (CRCL) at the Center for Advanced Vehicular Systems (CAVS) at Mississippi State University. Previous to her academic career, she did postdoctoral fellowships at Oak Ridge and Pacific Northwest National Laboratories. She received her interdisciplinary Combustion Engineering Ph.D. from the University of Wisconsin-Madison, working through the Engine Research Center. She teaches thermodynamics, heat transfer, internal combustion engines, and combustion science. Dr. Strzelec’s sustainable energy research interests are in the area of heterogeneous reaction kinetics and characterization with a specific focus on automotive combustion and emissions after treatment; low-temperature catalysis; particulate filtration; pyrolysis; and remediation of hydrocarbon contamination. Her work has been published in top journals, including Topics in Catalysis, Energy & Fuels, Fuel, and International Journal of Engine Research. Dr. Strzelec is the Vice Chair of the SAE Exhaust Aftertreatment and Emissions Committee and Associate Editor of the Journal of Emissions Control Science & Technology. She is a recipient of the 2016 SAE Forrest R. McFarland Service Award, the 2015 SAE Ralph R. Teetor Educational Award, and the 2015 Brittian Undergraduate Teaching Award. I sat down with Andrea to learn more about her background and research interests. (KS): Why did you get started in combustion research? AS: Right this moment, I’m working on building up my laboratory capabilities at the Center for Advanced Vehicular Systems (CAVS) at Mississippi State University, where I’m an Assistant Professor. I just moved here in May, so I’m getting my equipment purchased, and up and running. I’m also continuing my work on after-treatment devices, and specifically particulate matter – expanding from diesel into GDI – for both filtration and reactivity. KS: What does your lab look like? AS: Right now, like an active construction site…. But we have some AMAZING facilities here including multiple engine dynos and a 4-wheel chassis dyno! I currently have a PACCAR MX-11 (that I like to hug!) being installed on the AG500, a 1.8L single cylinder, and a 2L Subaru gasoline engine capable of running in PFI or GDI mode. In addition, my (after treatment) Reaction Characterization Laboratory is almost ready – this is where my Microreactor will investigate powder samples and my Bench Reactor will study miniature (1” x 3”) devices. Between the two systems, I can separate the kinetic and mass transport effects for a catalytic device, which is pretty cool. Plus, I have a filter evaluation setup, which uses a SMPS and differential pressure transducer to investigate size-dependent filtration efficiency and pressure drop for DPFs and GPFs. KS: What’s your favorite type of flame? AS: Laminar diffusion flames, of course. KS: What’s your favorite fuel? AS: Diesel! I love the smell of it! KS: What advice would you give students thinking about going into combustion research? AS: Do it! This is a dynamic field full of really great people. The combustion community is large, but also small – going to meetings (Combustion Institute, ASME ICEF, and SAE) is like going to a reunion! KS: Is the IC Engine dead? KS: How is your work helping improve fuel efficiency or reduce emissions? AS: My work to date has been very focused on after-treatment devices, which directly reduce emissions and diesel particulates – I love soot! These important, pollution-reducing devices can also have an impact on engine efficiency if there is a pressure drop across them, or if they aren’t well matched to the application. In addition, further development of after-treatment catalysts is necessary to enable some of today’s high-efficiency combustion strategies – especially those with low-temperature emissions. I’m really excited that here at Mississippi State, I now have both parts of the engine/after-treatment system. Motivated by these engineering challenges and scientific opportunities, my short-term research goal has been to establish a nationally-recognized, externally-funded research program focused on combustion, reaction engineering and materials for energy and the environment. My long-term research goal is to establish and lead an internationally recognized, multidisciplinary center that aims to advance the fundamental understanding, predictive modeling, and design strategies for sustainable energy, including combustion, which will continue to be a large part of the US energy portfolio. My professional aspiration is to develop into an accomplished and innovative scholar-teacher, providing seminal contributions and leadership in the field of sustainable energy and environmental materials, while simultaneously educating and mentoring the next generation of engineers.